A new study out of the National Institutes of Health (NIH) discovered that the substance gadolinium can be seen in certain stroke survivors' brain scans. This finding could revolutionize the way scientists evaluate the severity of their stroke patients' health. Doctors usually give the harmless substance gadolinium to patients before they get an MRI scan. While gadolinium is transparent to the naked eye, it can be used to indicate problem areas in a patients' brain scan. Gadolinium is usually filtered out of a patients' body when s/he urinates. This study reveals, however, that gadolinium can appear as bright white lights around the eyes in stroke patients' MRI scans. 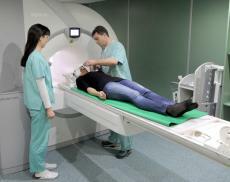 Study authors compared various MRI scans of over 160 patients at different times after their strokes. The earliest brain scans doctors looked into were taken right after the patient had his/her stroke. In these pictures, patients had no gadolinium in their bodies. Next, researchers gave gadolinium to these patients and took their MRIs both two and 24 hours after their strokes. Scientists report that 75 percent of study participants had the distinctive glowing eyes in their brain scans after 24 hours. 66 percent of patients showed gadolinium leakage in the two-hour photos. Study authors note that most of these scans showed gadolinium glowing in the front part of the patients' eyes in the two-hour scans. Interestingly, most 24-hour MRI scans showed gadolinium in the back of patients' eyes. There was no significant difference in the degree of gadolinium leakage between patients who received tPA treatment and those who didn't. Although doctors aren't sure yet, they believe gadolinium leaks into the eyes of certain patients due to the severity of their strokes and their overall health. For instance, study authors note how most of the patients who had gadolinium leakage in the back of their eyes also had hypertension. Researchers also say that patients who had gadolinium leakage in both eyes tended to have more severe strokes than people with only one glowing eye. Doctors also believe these gadolinium lights could indicate the severity of patients' mental health issues as a result of the stroke. Although this research is still in its initial phase, scientists are hopeful they can develop another chemical like gadolinium to track a patient's risk for stroke without the need of an expensive brain scan. A cheap, harmless eye scan could help doctors better predict strokes. NIH workers hope to better understand the links between gadolinium leakage and strokes in future tests. They also want to see if gadolinium can leak at all in the eyes of non-stroke patients. A few warning signs that a person might be having a stroke include trouble speaking, muscle stiffness, light headedness, sudden headaches, and balance issues. Anyone who has any of these symptoms should be rushed to the emergency room immediately. Doctor Richard Leigh, who works as an assistant clinical investigator at NIH's Neuro Vascular Brain Imaging Unit, was the lead author of this study. The NINDS Intramural Research Program was a major financial backer of this study. Anyone who's interested in reading this full study should pick up the most recent copy of Neurology. Professors entitled this study, "Blood–ocular barrier disruption in acute stroke patients."